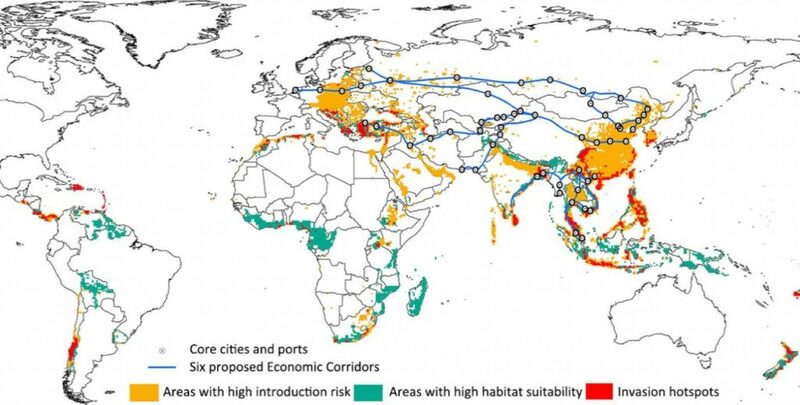 In a review in Currrent Biology published on January 24, researchers around LI Yiming of CAS Institute of Zoology discuss evidence that economic corridors between core cities and key ports along traditional international transport routes may also lead to the introduction of invasive species into new areas which may threaten native species and biodiversity. According to their analyses, approximately 15 percent of areas in BRI countries have high overall introduction risks of new vertebrate species as people and cargo move about. The researchers identified 14 “invasion hotspots”. Based on these findings, they call for stricter screening for alien wildlife, including imported commodities, vehicles, and equipment through airports and seaports and along other transportation corridors. Noting limited resources in many BRI countries, they also suggest the establishment of a special fund to support the operation of biosecurity measures.